The DCW-400ES Arc Welders, from Redstar Equipment , are ideal for welding pipelines and performing welding methods, including strick, tig, mig flux-cored and gouging. The DCW-400ES uses a 20kVA/60Hz high-capacity generator, with a voltage regulation within +/- 1.0%. High quality AC power can also be used during welding performances. It utilises a low rmp, high output diesel engine with easy low speed operations, providing the arc welders with longer life. The DCW-400ES Arc Welders feature an e-mode operation that reduces and fuel consumption by 25-30% and a hood structure that incorporates a new cooling system to dramatically lower noise levels. The DCW-400ES Arc Welders are available from Redstar Equipment and can be used in a wide range of locations, from very hot to cold climates. 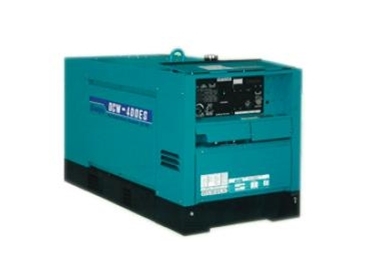 These arc welders are ideal for high quality welding and as a dependable source of power.